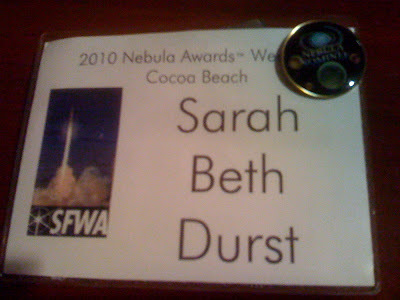 I'm writing this in the airport en route home from Nebula Awards Weekend, held this year in Cocoa Beach, Florida. My novel ICE was nominated for SFWA's Andre Norton Award for Young Adult Science Fiction and Fantasy. You want to know the best part of being nominated for an award from SFWA (the Science Fiction and Fantasy Writers of America)? Once you arrive at the event, you are spirited away to a secret room, which you must access by aligning a series of steampunk-esque locks. You are then asked a series of questions, ranging from "What is the answer to life, the universe, and everything?" to "Would you like jam tomorrow or jam yesterday?" If you answer correctly, you may proceed. If you fail, you are dropped into the Pit of Eternal Stench (or the Great Pit of Carkoon on Tatooine, depending on your preference, which you stated during the registration process, along with your beef, fish, or veggie choice for the banquet). If you succeed, you are presented with your unicorn. As I write this, mine is attempting to bust his way out of my carry-on luggage. I'm hoping my unicorn will fit under the seat in front of me. If he doesn't... well, I don't relish the idea of explaining to the flight attendant why the overhead bin is full of unicorn poop. Okay, okay, there was no secret room or unicorn-as-swag. 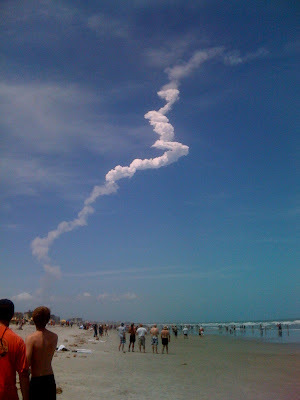 But there was a space shuttle launch, which is as awesome as a unicorn. (In fact, I think that should be NASA's new motto: "Space, as awesome as unicorns.") The awards weekend (aka the Nebs) was planned to coincide with the third-to-last space shuttle launch, the final flight of the shuttle Atlantis. 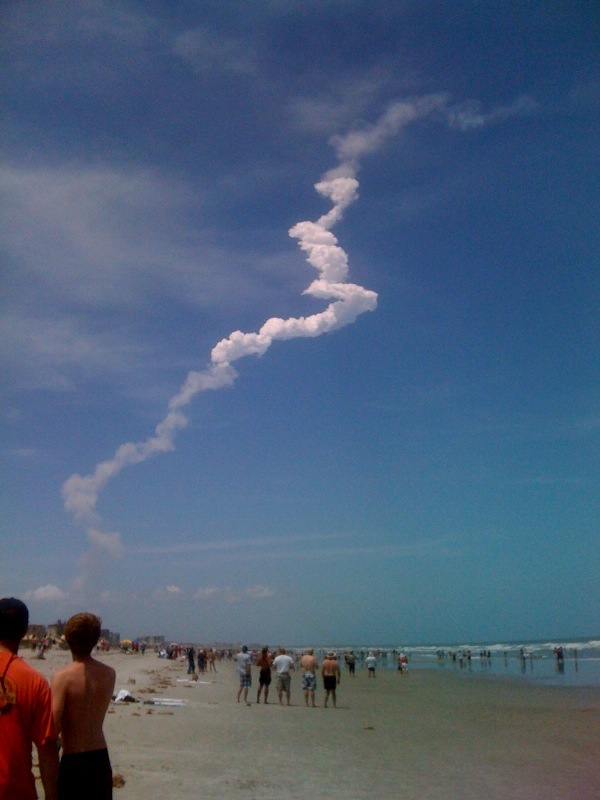 Launches are visible from Cocoa Beach. I nearly missed the launch due to the tremendous traffic -- everyone else in the state of Florida was also attempting to drive to the coast to see the launch. But I arrived at the hotel ten minutes before launch, dropped my suitcase at the front desk, and booked it out to the beach. Lots of people were already there. All of them were standing (as if that would bring you closer to the shuttle than sitting) and looking north. Kind of looked like everyone was waiting for an alien invasion. At precisely 2:20, I saw a fat firecracker rise above the palm trees and hotels to the north. I was pretty sure it wasn't the shuttle because I thought that the water tanks in the distance were the launch pads. (Not so much.) Also, I'd expected applause or a collective "oooh" from the watchers. (Everyone was busy taking photos.) But I figured out reasonably quickly that fireworks aren't that fat. This was a long fat orange flame followed by billowing white smoke. It looked like the orange fire was giving birth to a huge cloud snake. After a while, the snake ended, but you could still see the shuttle as a white dot. Eventually, it vanished, and the snake slowly coiled in on itself and drifted away. Before the launch, I'd noticed a group of people near me were wearing SFWA Nebula Awards Weekend name tags. I was too shy to say hello at first, but I reminded myself that I'd earned my unicorn (so to speak) and introduced myself. I spent the remainder of the weekend in pretty much constant conversation. For the ceremony, the nominees were called on stage by Russell Davis (current SFWA president) and given a special pin and certificate by Neal Barrett, Jr. (this year's author emeritus). Later that night, I discovered that if you press the pin and spin around, it will open a portal to another dimension. Totally kidding. The portal goes to Schenectady. On Saturday night, there was the Awards Banquet. Honestly, I wasn't the slightest bit nervous until I walked into that banquet hall. 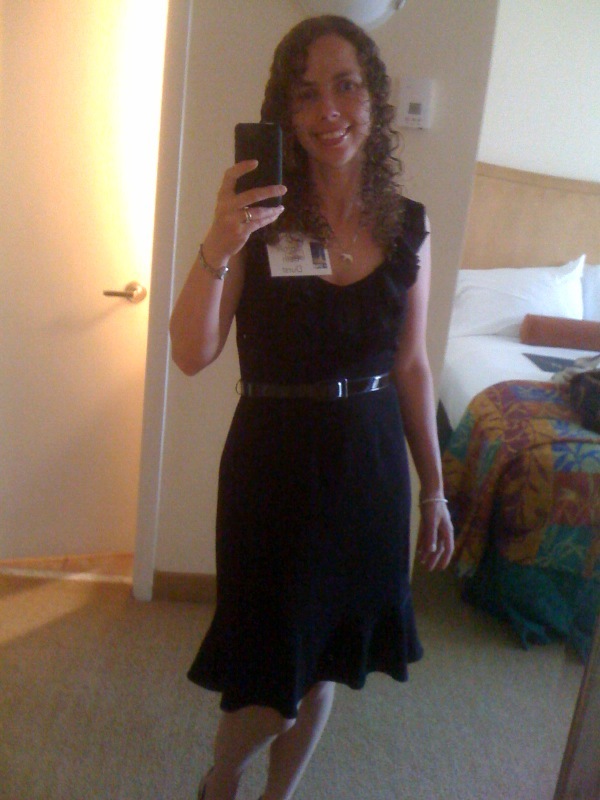 Once I was inside, I promptly started imagining that either (A) I'd win and forget to thank my husband, who is the heart and soul of everything I do, and then have to spend the next several decades trying to win something again so that I could have a do-over, or (B) my dress would inexplicably fall off. I even wore makeup for the occasion (which is shocking considering that I can count on one hand the number of times that I've worn makeup). Also wore my polar bear necklace. Best dressed for the night goes to Mary Robinette Kowal who wore an Oscar red-carpet-worthy gown, James Marrow who wore Godzilla slippers, and Bud Sparhawk who wore all his Nebula pins as buttons on his tux. The event itself was extremely cool. Lots of wonderful speeches. Catherynne Valente, who won the Andre Norton Award, gave a particularly lovely speech about how this book was like a fairy tale, saving her at a time when she needed saving, but how she never expected a glass slipper at the end of it. Connie Willis gave a very funny and sweet introduction to Joe Haldeman, the Grand Master. David Levine showed fantastic photos of his two weeks inside a Mars simulation. And Allen Steele kept everything moving as toastmaster. But my favorite moment (other than when Tom Doyle announced the nominees for the Andre Norton Award -- totally felt like the Oscars!!!) 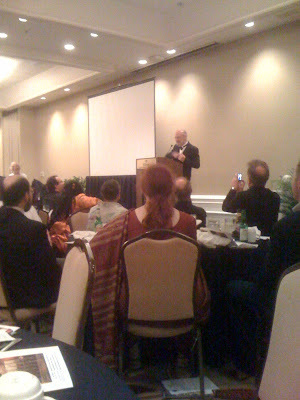 was when Eugie Foster won for novelette. 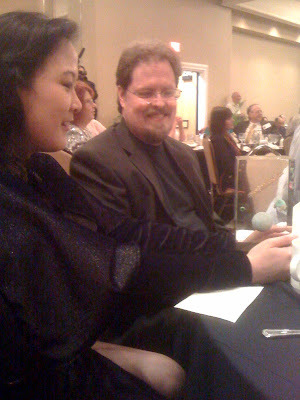 She and her husband Matthew were sitting next to me for the banquet, and the absolute stunned joy on her face when her name was called... and the look of love and pride on her husband's face... I totally got tears in my eyes. The two of them were radiating joy. My favorite line of the night was after the banquet, after Paolo Bacigalupi had won the Nebula for Best Novel, he said, "I'm embarrassed to be this happy." Like Eugie, he was radiating happiness. He was even still smiling the next morning, despite total lack of sleep. My favorite non-awards-related time of the convention was drinking pina coladas at the outside bar with Laura Anne Gilman with a view of the ocean in front of us and a very stubborn yellow butterfly behind us. Lastly, my favorite take-away from the event... I came away from the weekend feeling inspired to write, write, write! So thank you, SFWA. You're all awesome. And the unicorn is great too. This whole post was cool, but your DRESS! So pretty, so flattering. Also, I must ask: What color are your shoes? They look gold in this picture--are they really? And are they just as fabulous as your dress? The whole event sounds so cool! You looked so lovely in that dress! The whole event sounded magical. *blush* Glad you guys liked the dress! Q: Just black shoes. I'm a comfy shoes kind of girl. Also completely uncoordinated in heels. SavyLeartist: It was VERY cool. Wish it could have lasted longer. Laura: Best thing about being a writer is writing. But events like these are definitely an awesome perk! Are you worried going to events like that? Or all bubbley with happiness? Yes, SUPER cute dress! Sounds like you had fun! Loved reading about the shuttle launch. :) Sorry I missed your "waving" tweet until you were at the banquet! I hope the class went great! Sarah, the dress is a knockout! Watch out, world! Congratulations for your nomination, Sarah! It sounds like you had a wonderful trip. Love your dress, you are so pretty. And that last picture is breathtaking! So you saw the rocket launch too? I loved it! Anyway, I hope you had fun at the Nebula Awards! It seems like fun! Wow! Look how pretty the beach is!!!! And you looked so good in that dress!!!!!!! Laura: A little of both. I am a naturally shy person, but I also love people. I had a lot of fun. Em: Thanks for waving! *waves back* The panel went well. I talked a lot about my fondness for Twitter. Valerie: Thanks! Think I’m going to wear it again for an upcoming wedding. Dave: It was fantastic. Thanks so much! Erin: *blush* Thanks, Erin! The beach wasn’t actually as hazy as it looks in that last picture. Really need to clean my camera lens. It was beautiful there, though. 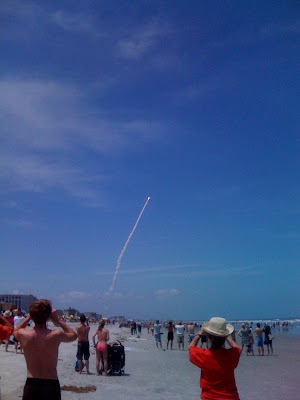 Phebe: It was fun, and the shuttle launch was amazing. Jordan: Thanks so much! 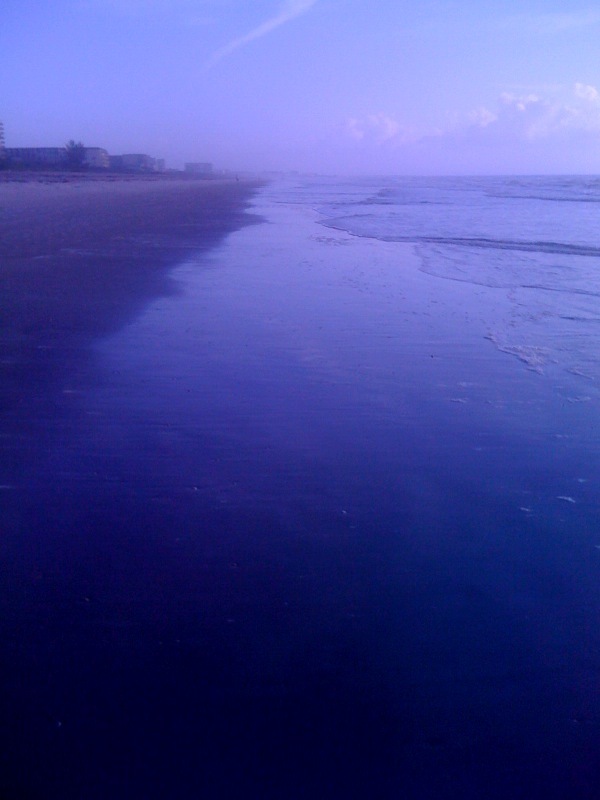 I loved walking on that beach. There’s just something so magical and yet so real about feeling sand under your feet and listening to the waves crash next to you. ICE is an Andre Norton Award Finalist!! !